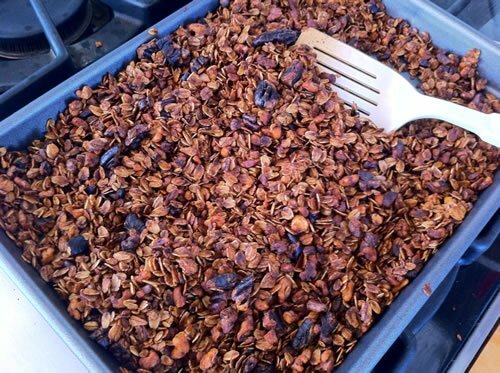 My dad’s been making his own granola for quite a few years, and I think by now he’s perfected the recipe. At least, he’s now got it exactly the way he wants it. And oh yeah, it’s a heck of a lot cheaper than buying the pre-made stuff. I made a small batch this morning. I didn’t have on hand the nearly 10 cups of oats that his recipe calls for, so I simply made 1/4 the recipe. I also had only a few almonds left in the pantry, so I substituted chopped walnuts (and still included the pecans). I then splurged a little and added 1/4 tsp. Almond Extract for some bonus almondy yummness. So even if this recipe isn’t fat- or sugar-free, I believe it’s still a wholesome addition to your breakfast lineup. As always, fresh, unprocessed, whole foods are totally the way to go. Keep in mind that the serving size should be small: 1/3 cup. Spoon onto a large, flat baking sheet (lightly oil pan if not non-stick) and bake at 350°F for 45 minutes. Stir well every 15 minutes. After 45 minutes, take a small amount out, let it cool for a minute, and test for doneness. If still soft, bake an additional 8 minutes, and test again. Do not overcook. 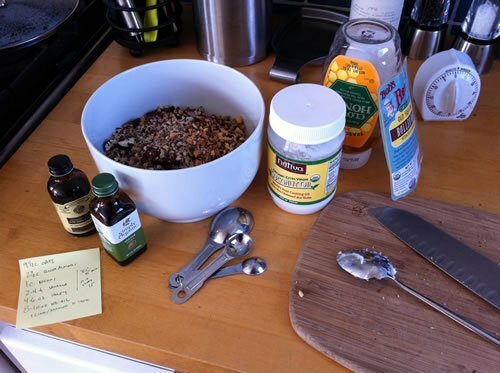 I’ve made granola from a very similar recipe but it doesn’t include oil, just honey, oats, and nuts. Has Dennis tried this without oil or with less oil? I’m wondering what difference the oil makes in the final food. I can’t imagine spreading the mixture throughout all those dry oats and nuts w/o the oil. Would also seem to cook up harder and crunchier with just honey? And I’ve found the more oil the ‘flakier and delicate’ the texture, which I prefer. I am going to try making this, but with maybe half the oil. And I’m going to use macadamia nut oil! 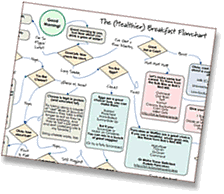 Ooh – Macadamia Nut Oil sounds good! Be careful not to overcook it… I kept it in the extra 8 minutes when I shouldn’t have. What my dad didn’t explain in his direction is that it’ll still feel soft — you have to let your taster/sample cool for a minute or two to see if it’s crunchy enough.